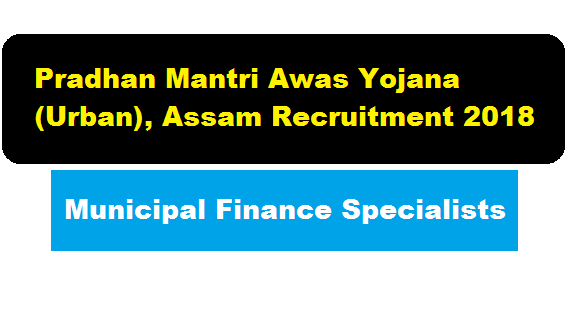 In this section, we will discus in detail about Recruitment of Municipal Finance Specialists Posts Under Pradhan Mantri Awas Yojana (Urban), Assam Recruitment 2018 with all the details and requirements . i/Graduate degree in finance or equivalent qualification from recognized university with 3-5 yrs. experience. ii/ Skills to evaluate urban infrastructure investments, and helping city governments to examine and use a range of options for financing projects. Brief Role and Responsibilities: Prepare Financial Operating Plans for the city in line with Mission guidelines. Provide technical support to the ULBs/city level bodies to implement the financial plan. Prepare specialized training materials/modules, process manuals, procedures, toolkits, guidelines and other related activities for undertaking capacity building programmes on financial management. Any other related activities as decided by the administrative head of the ULB. Interested and eligible candidates may apply online at http://pmayassam.in/index.php/online or click here to apply online.